It’s been a while since last posting. A few weekends spent with friends and not the usual routines. A great time, though probably too much wine. What the heck, it doesn’t happen very often. Tonight was a winter evening, not too cold, but gloomy. Definitely called for some comfort food. So a quick search through the world of google, and I decided on an Annabel Langbein recipe, with potatoes and a fresh cos salad. A few changes to the recipe – of course – and very definitely a repeater…..
AL’s recipe was for six, so I halved it as there was only Mr MWCED and myself. We still had enough for a left-over dinner another night. Cooking time is about 1-1/4 hours. 6 skinless chicken thighs – original recipe suggested boneless – but ours were bone-in and I think they are tastier. Plus my package only had 5. As it was, we ate 2 – so go with whatever you think you need. 1/4 cup chicken stock – original calls for either cream or stock. We rarely, if ever, use cream in cooking, so no contest. But you might like it. Heat butter in a heavy pan, add leek and shallots and season with salt and pepper. Cook over low heat, stirring now and then, until softened and no longer bright green (about 15 minutes). While the leek and shallots are cooking, place chicken in a bowl with mustard, worcestershire sauce, cayenne, thyme and salt and stir to combine. Allow to sit for 10 minutes while the leeks cook. Remove cooked leek and shallots from heat and mix in chicken stock. Spread evenly in the base of a large, shallow baking dish. Arrange chicken thighs on top then cover with Provençal Crust. The gratin can be prepared in advance to this stage and chilled for several hours until needed.When ready to cook, preheat oven to 180°C. 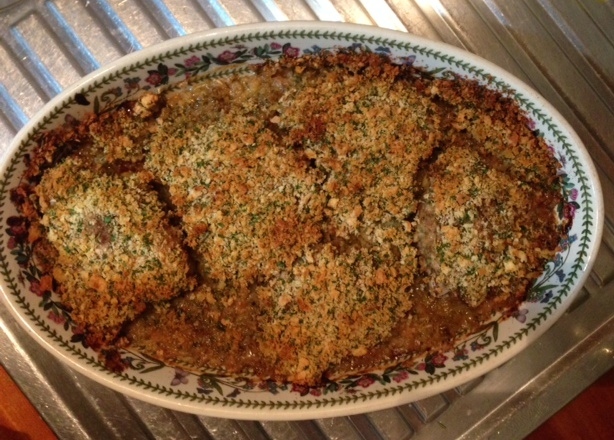 Bake until chicken is fully cooked through and crumbs are golden (about 1 hour) – maybe slightly longer with bone-in. Our oven tends to need more heat, so I whacked it up to 220 C, which was fine. very hard. Put into food processor with all other ingredients. Pulse until crumbly. Provençal Crust will keep in a container in the fridge for up to a week or can be frozen. 3. Heat non-stick pan on medium heat on stove top for a few minutes before adding oil and half of the butter. 4. Add potatoes, stir to coat with oil and season with salt and pepper. 5. 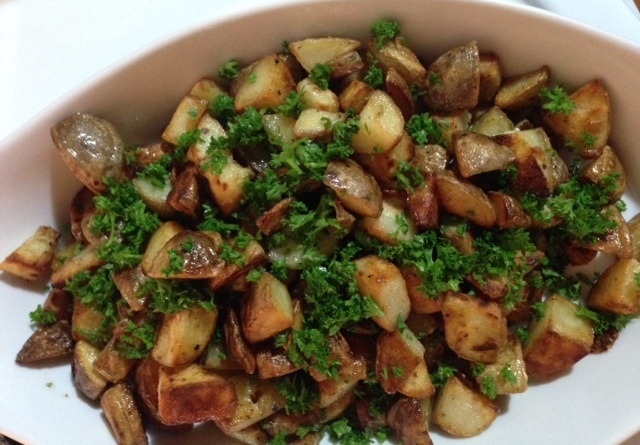 Stir potatoes every 5-10 minutes, adding rest of butter as they cook. 6. Cook about a total of 30-45 minutes, or until they are browned to your personal satisfaction. It worked out to be a great combination, and totally delicious. Now, what shall I cook for Sunday night?